Work for IBM Information Server on Cloud? Learning about IBM Information Server on Cloud? What ETL Tools solution do you use? AWS Glue is a fully managed extract, transform, and load (ETL) service designed to make it easy for customers to prepare and load their data for analytics. AWS Import/Export Snowball is a petabyte-scale data transport solution that uses secure appliances to transfer large amounts of data into and out of the AWS cloud and addresses common challenges with large-scale data transfers including high network costs, long transfer times, and security concerns. Skyvia is a universal cloud platform for no-coding data integration. It allows you to ETL SaaS and database data in both directions, replicate cloud data to databases, import/export CSV files on schedule, create OData services, manage data with SQL, back up cloud data, etc. It supports all major cloud apps and databases, and requires no software except a web browser. AWS Data Pipeline is a web service that helps you process and move data between different AWS compute and storage services, as well as on-premises data sources, at specified intervals. 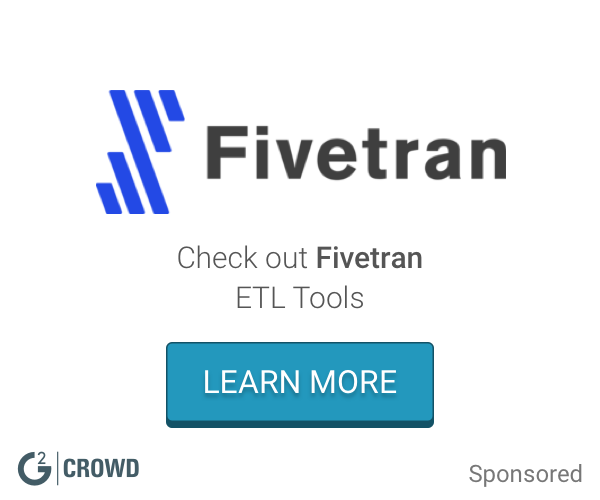 Fivetran is an ETL tool, designed to reinvent the simplicity by which data gets into data warehouses. Use the most popular data loader for Salesforce to quickly and securely import, export and delete unlimited amounts of data for your enterprise. Get started quickly with our simple, 100% cloud solution. Blendo is an integration-as-a-service platform, designed to enable companies to extract a multiple of data (sales, marketing, product, customer support, etc) from different cloud services, integrate it and load it into their own cloud-based data warehouses for analysis. SAP Cloud Integration facilitates the integration of business processes and data across on-premise and cloud applications (cloud-cloud and cloud-on-premise integration). Process integration capabilities allow you to integrate business processes spanning different companies, organizations, or departments within an organization. Data integration capabilities allow you to efficiently and securely use ETL (extract, transform, load) tasks to move data between on-premise systems and the cloud. The Actian Cloud Edition offers Actian DataConnect (previously Pervasive Data Integrator Cloud) – a fast, powerful, cost-effective and easy-to-use data integration tool. * We monitor all IBM Information Server on Cloud reviews to prevent fraudulent reviews and keep review quality high. We do not post reviews by company employees or direct competitors. Validated reviews require the user to submit a screenshot of the product containing their user ID, in order to verify a user is an actual user of the product. Hi there! Are you looking to implement a solution like IBM Information Server on Cloud?